Even without Saquon Barkley, Penn State's offense should still be in fine shape in 2018. For the second season in a row, Penn State is coming off the bowl season with the anticipation of what comes next for the program. Only this time, the Nittany Lions do so having cleared a notable hurdle that has been a long time coming for the program. For the first time since outlasting Bobby Bowden’s Florida State in the Orange Bowl at the end of the 2005 season, Penn State celebrated a major bowl victory after holding on to knock off Washington in the Fiesta Bowl. So, what’s next for James Franklin and Penn State? Despite some notable changes with the program between the 2017 season and the 2018 season, Penn State should be in prime position for a potential run to the Big Ten title, and a spot in the College Football Playoff. Gone is offensive coordinator Joe Moorhead, who has taken over as the head coach at Mississippi State. But the first game under new offensive coordinator Ricky Rahne demonstrated the offense is still likely to be in good hands and the offensive identity may not change all that much. The Nittany Lions will likely be without the services of running back Saquon Barkley, who many expect will announce his departure for the NFL at any moment. Losing Barkley will be a big loss to replace, because nobody can just replace Barkley. However, the running back group should be in good shape with Miles Sanders (a former top running back recruit the year after Barkley joined the program) stepping into the starting role. But having quarterback Trace McSorley should lead to Penn State’s offense not skipping much of a beat in 2018. While covering the Fiesta Bowl for ESPN in the broadcast booth, McElroy at times suggested McSorley was similar to Oklahoma quarterback and 2017 Heisman Trophy winner Baker Mayfield. The comparison made some sense given McSorley’s style of play and willingness to take chances through the air and take off to run when it is called for. He’s a bit of a gunslinger and there are times when a gamble going deep doesn’t work out as planned, but then there are the moments where McSorley zips a pass so perfectly that it is impossible not to be impressed. 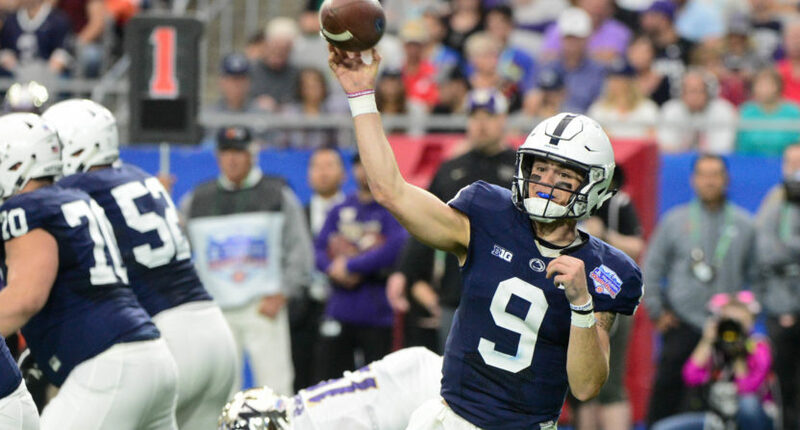 McSorley was locked in on third down against Washington, who entered the Fiesta Bowl with a top five defense, as he completed 12-of-12 pass attempts for 193 yards and two touchdowns without an interception. How does one even comprehend that kind of efficiency? Are there quarterbacks with better pro potential? Absolutely. But you will be hard-pressed to find another quarterback who is unflappable as McSorley heading into the 2018 season. If Penn State is going to make a playoff run, then they have a schedule that should be at least a bit more favorable next fall compared to what they went through in 2017. The 2017 season had a three-game stretch against Michigan and back-to-back road games against Ohio State and Michigan State in a three-week span. Next fall, those games will be a bit more spread out. Penn State will open the season against Appalachian State, who even though finished their season with a dominating shutout of Toledo should pose a mild threat at best to the Nittany Lions in the season opener. After that is a road trip to western Pennsylvania to take on Pitt. The Panthers are not to be taken lightly, but the two programs are on much different levels at this point in time. September ends with a home game, against Ohio State. The Buckeyes will likely be your preseason Big Ten favorite, as they typically are, but getting them at home next fall and looking to avenge letting one slip away in Columbus will be a fascinating storyline. Penn State has played well against Ohio State the last few years, and a home game in late September could end up being a win. If it is, game on for Penn State, who could head into their bye week 5-0 before returning with a home game against Michigan State. Another revenge game, at home. Penn State will draw Iowa and Wisconsin in cross-division play, although both of those games will also be at home in the second half of the season. Penn State’s trickiest road trip will come on November 3 at Michigan. Don’t expect the Wolverines to be as lackluster on offense. That game could carry significant Big Ten title implications, and potential playoff implications for Penn State and the Big Ten. After two straight 11-win seasons, Franklin has Penn State back and a step back does not appear to be likely. The schedule is favorable for a team looking for a run to a Big Ten title and a spot in the playoff, but Penn State must avoid letting a golden opportunity slip through the cracks as they did in two losses by a combined four points at Ohio State and Michigan State despite holding leads in the fourth quarter. Washington made Penn State sweat it out in the Fiesta Bowl, suggesting Penn State needs to learn how to finish off games with a bit more authority. Do that, and Penn State could be on their way to a spot in the College Football Playoff a year from now as the Big Ten champion.